Pinterest has shaped up to be THE social media darling to grow your blog or website. It is more effective than Facebook and Twitter at drawing traffic to your site--if you know how to use it to your advantage. 1. Add a Pin It button to your website or blog. You want to make pinning your content as simple as possible for your readers. 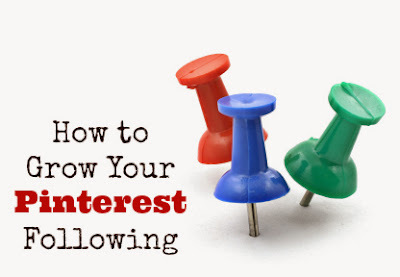 The more frequently your posts get pinned, the more likely you are to garner new readers who find your pins on Pinterest. 2. Create pinworthy pictures, and add a picture to every post. If you're not a visually oriented person, creating a pinworth picture for every post can be tiring, but without a picture, your post, no matter how informative, funny, or well written it is, can't be shared on Pinterest. Use a free site like PicMonkey to create a caption for your picture and make it pinworthy. If you have trouble navigating PicMonkey, just search the web and you'll find several tutorials for using it. 3. Pin frequently and at the right time. Try to pin a few times a day, and pin a variety of pins. If you're searching for ideas for your daughter's fairy-themed birthday party and you pin 25 pins at the same time related to fairies, you run the risk of annoying your followers. Instead, try to pin a variety of content. The most popular times for pinning are the afternoon, from 2 to 4 p.m., and the evenings after 9 p.m. Try to pin during these times to maximize your follower interactions. 4. Pin mostly posts from others, 25% your own. Pinterest is about sharing. Pin your own content no more than 25% of the time. The rest of the time, pin others' content. 5. Join a Pinterest group board. Group boards are very powerful. You reach not only the members of the group, but all of their followers, too. Many people credit their success on Pinterest to utilizing groups. You can search Pinterest for group boards, or, if you have a group of blogging friends, you could start a group board together. As your number of followers grows, you will likely get requests to join group boards. Before you join, make sure you analyze the group board and make sure it's not spammy. Also, remember any group board you join should fit in with your mission as a blogger. 6. Search Pinterest's popular page regularly. One of the best ways to create viral content is to find out what other people are pinning. A regular check of Pinterest's Popular page (http://www.pinterest.com/popular) can help you discover what is trendy. If you take the time to create similar posts for your own blog, you can benefit from the trend. A Pinterest account with a large number of followers can grow your website or blog more than you can imagine. Use these tips to grow your Pinterest following. What is your favorite technique for growing your Pinterest account?